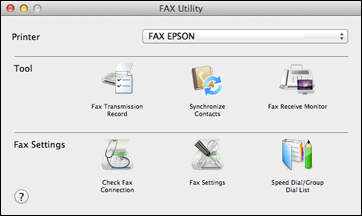 How do I save faxes to my Mac instead of printing them? On your Mac, open the menu and select System Preferences. Select Printers & Scanners, Print & Fax, or Print & Scan > FAX EPSON [your product name] > Options & Supplies > Utility > Open Printer Utility. Select FAX EPSON [your product name] in the Printer list and select Receive Settings. If necessary, click Next. Select "Save" (save faxes on this computer). You can also select a location to save your faxes by selecting Save to. Click Send to send the settings to the product.